Learning a foreign language is an integral component of studies at the Viadrina because of its international orientation. 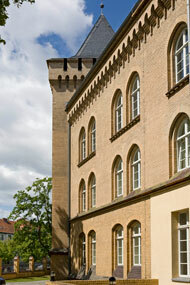 The Language Center (Sprachenzentrum) of the European University Viadrina is responsable for organizing language courses during the semester. Language courses are given by native speakers mainly. The courses lead to the award of a certificate (Unicert II or III) with a specialisation in Law, Economics or Cultural Sciences and are accredited within the framework of „Unicert“. Language training and the certifications are in accordance with references of the Council of Europe. if you already have a certain knowledge in the languages Russian, French, English and German you will have to take a placing test. Within its exchange programs the European University Viadrina offers every guest student the opportunity to take part in one German language course per semester for free (This does not include the intensive German courses!). For all of the other language courses, guest students have the same financial obligations as regular Viadrina students. 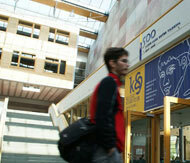 For further information please consult the web site of the Language Center (Sprachenzentrum). Before the beginning of the semester Viadrina Sprachen GmbH offers you the chance to improve your German language proficiency or to introduce you to the German language. On a special web site (Profis Project InterViadrina) the German department of Viadrina provides you with useful information about studying German and the required German text in order to begin your study at Viadrina as well as special offers such as online exercises, a (humorous) psychotest to the German culture, the tandem system and much more...it is worth a visit! The Multimedia Self-Access Study Centre is located in room 016, August-Bebel-Straße 12. By using learning material such as books, magazines, DVDs, multimedia software etc., students have the opportunity to get directly in touch with the culture of the language they are learning.